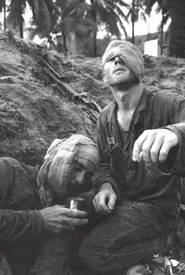 In the review of Vietnam War Facts, we noted the schism between the government and the public, and the passions that were evoked in many Americans about their belief that the war was immoral. The Cold War was raging, and the collective memories of a hot war in Korea kept the subject of communism on the front burner. Anxiety about the former, and war weariness from the latter, created a division about a new war. 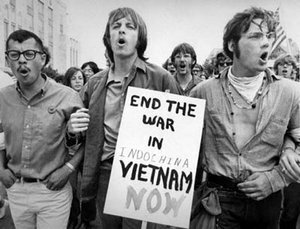 As revelations of atrocities (on both sides), accounts of American deaths, and questionable enemy body counts mounted, there was a significant shift of view that increased support for an anti- war movement. Prior to 1965, there was a distinctive "leftist" view. It was against any foreign adventurism and their focus was on domestic issues. This movement fit easily into an anti- war movement, and protests could be reasonably expected from this quarter. The slow slide of the "broad middle" into vigorous protest was the most troubling to authority. They were buttressed by the veterans who lived to tell the story of organized chaos. These veterans helped turn the tide of public opinion when they returned home with mental and olfactory memories that were never forgotten. The odor of the fetid jungle, the rice paddies, that appeared so idyllic, reeked with the stench of buffalo fertilizer, and when joined with the decay of dead comrades fueled their disgust with what they deemed was a senseless war. They made formidable witnesses against the war. Protests against involvement in Vietnam reached the streets of several cities. May 2: The Progressive Labor Party and the organization of Young Socialists were in the forefront of organizing protest demonstrations. May 12: A dozen young men publicly burned their draft cards at a rally. A year later on October 1965, David Miller, a pacifist in a Catholic organization, was arrested for the same act. He was convicted in a lower court and began the appeal process. His case reached the Supreme court in 1968. They held that his actions violated the Selective Service Act of 1948, and the Act did not violate his free speech rights under the First amendment. February: Students gather to protest the apparent march toward war on the campus of Kansas University. 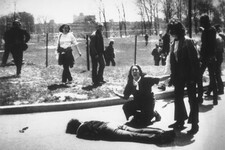 March 24: Students For A Democratic Society (SDS) stage a teach-in protest class at the University of Michigan. Their militant rhetoric was influenced by the Cuban revolutionary, Che Guevera. March: Jerry Rubin would become a prominent leader of the protest movement. 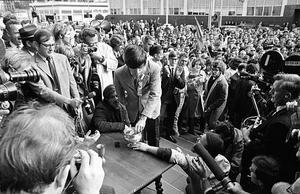 He organizes a Vietnam Day Committee at Berkeley, California, and brings out 100,000 people to participate in draft card burning. Penalty, if convicted: 5 years imprisonment and $10,000 fine. The early draft granted 2,000 college deferments. April 17: 15,000 students join in Washington, D.C. to protest U.S. bombing campaign. September: Less than 6 months into the formal commitment of troops in Vietnam,a sergeant in the U.S. Special Forces quit the elite Green Berets rejecting participation in the war. In 1966, the pattern continues when an army doctor refuses to train medics when Green Beret atrocities were disclosed. Anecdotal in the early stages of the war, but common place as the war proceeded. 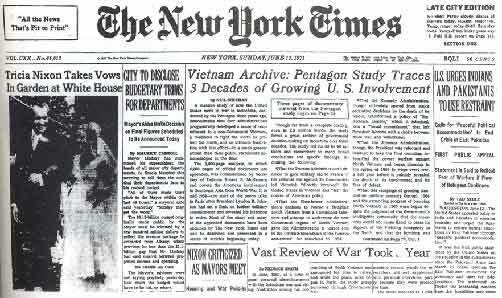 December 27: Three American antiwar activists including the California State Senator, Tom Hayden, visit Hanoi. 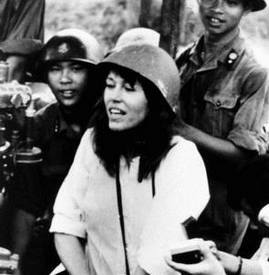 He later marries Jane Fonda (1973), a high profile actress and major figure in anti-war protests. January 31: Senator Robert Kennedy objects to the Johnson Vietnam policy. Walter Lippman, a respected journalist, predicts the failure of Johnson bombing strategy. February: U.S. Senatorial Foreign Relations Committee decide to support a policy that protects South Vietnam sovereignty. March 1: A senate vote to repeal the Gulf of Tonkin Resolution only garners 5 votes. March 9: The Academic community objects to U.S. bombing policy that destroyed 20,000 acres of South Vietnam crops. March 10: U.S. learns of anti South Vietnam protests by Buddhists and students in Danang and Hue---and American casualties. June 30: Three privates, "Fort Hood Three", announce they cannot fight in an immoral war. September 1: French President DeGaulle, armed with French baggage in Indochina, calls on the United States to leave Vietnam. January: Senators led by Robert Kennedy demand talks between South Vietnam and the Viet Cong. He is joined by Eugene McCarthy; a likely candidate for president on the Democrat ticket. Richard Nixon campaigns on a law and order platform targeting hippies, radicals and black nationalists. President Johnson's response to the "doves" echoes Nixon: "Nervous Nellies". February: American Religious groups call for a "fast for peace". April 14: Republican nominee, Richard Nixon, states that the anti -war protests "prolong the war". This remark is measured against the background of 200,000 demonstrators in New York and San Francisco. April 28: General Westmoreland, Commander of American forces in Vietnam, addresses a joint session of Congress. "In evaluating the enemy strategy it is evident to me that he believes our Achilles heel is our resolve. . . . Your continued strong support is vital to the success of our mission. . . . Backed at home by resolve, confidence, patience, determination, and continued support, we will prevail in Vietnam over the communist aggressor!" April 28: Heavy Weight boxing champ Muhammad Ali rejects his draft call on religious grounds, but adds:“I ain’t got no quarrel with them Vietcong". Ali claimed he was a conscientious objector. After trial, charged with draft evasion, he was found guilty. On appeal, the Supreme Court reversed the conviction. May 13: Led by New York City firemen, 70,000 march in support of the war. June: Formation of Veterans Against the War (VVAW). July: Polls find over 50% of Americans reject President Johnson's Vietnam strategies. August 8: California Governor Ronald Reagan advises we leave Vietnam. October: Life Magazine repudiates earlier support for the war. 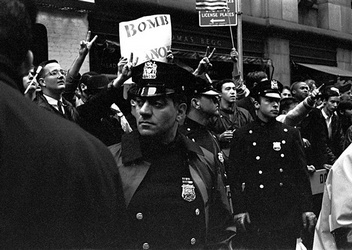 December: Four days of war protests in New York City. This year will identify 221 student protests at 101 universities. January-April: North Vietnam's Tet Offensive shocked Americans with scenes of atrocities, wholesale death and footage of wounded and dead American soldiers. February 1: This public execution supports war protestors claims of atrocities . 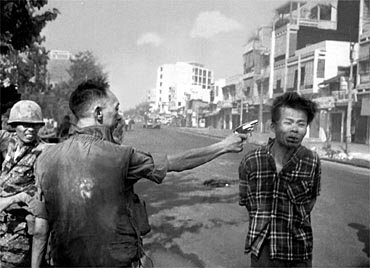 Director of National Police, Nguyen Ngoc Loan, personal friend of South Vietnam Prime Minister Ky, summarily executes alleged Vietcong captain. March 12: Poll finds 26% support for continuing the war. 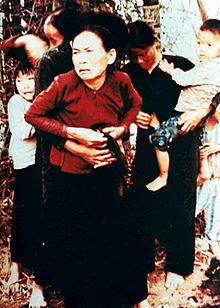 March 28: My Lai massacre revealed the mass killing of civilians leading to the trial of Lt. William Calley and further inflames the American public protests. March 31: President Johnson announces he will not run for reelection. This follows Robert Kennedy's announcement he will run for president. 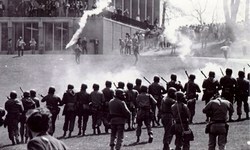 April 23: Columbia University students seize 5 school buildings and refuse to attend class. The latter tactic also repeated by 300 Harvard students. June 6: Robert Kennedy is assassinated. August 28: For almost a week at the Democratic presidential nominating convention in Chicago. 10,000 protest the war. Chicago police exacerbate street rallies and attack the protesters. Hubert Humphrey is nominated and will lose to Richard Nixon on November 5. The new president later promises a policy of Vietnamization---turning the war over to the South Vietnam army. 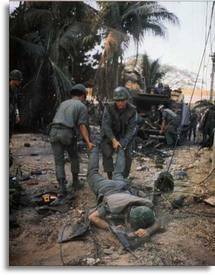 1968 remains the most merciless year of the war: American dead 16,899; wounded 150,000. "Hell No, we Won't go"......."America, love it or leave it"
June 10: President Nixon withdraws 25,000 Americans from Vietnam. June 18: Chicago is the venue for an SDS Convention. Their anti war ideology is both anti imperialistic and anti racism. They believe that the war is genocidal. The convention also fosters a split in their ranks. 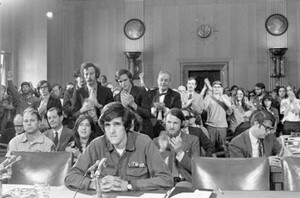 A break away group known as the Weather Underground advocated a more militant stance that will include sabotaging government property and war materials. August 17: During battle in Queson, some Americans refuse to fight. October 6: The Weathermen plant a bomb at the foot of a police memorial statue. (That statue will be rebuilt several more times and the Weathermen response is to blow it up again. )They will be involved in incidents every year of the war and beyond. October 9: Days of Rage---Chicago police respond to anti war demonstrations with tear gas and shot six---28 policemen were injured. The press is critical of the demonstrators and arbitrarily lump them together without regard to those seeking peaceful means to stop the war and the more militant groups. October 15: Largest demonstrations to end the war sweep the country. November 15: Peace demonstration in the nation's capital draws 250,000. 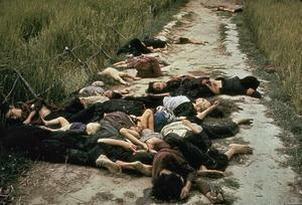 November 16: U.S. Army joins public discussion of My Lai Massacre. One year later a military court finds Lt.Calley guilty. Sentence reduced to 10 years, but freed in November 1974. Calley is the only one found guilty although 16 soldiers are charged. May 1: President Nixon calls the protestors "bums blowing up companies". May 4: Four students shot and killed at Kent state University (OH) and two killed at Jackson State College (MS) at demonstrations. Sparks demonstrations all over country's college community. May: Over a number of days in New York City, construction workers attack protestors in financial district. June 24: Senate challenges presidential authority to continue war by repealing Gulf of Tonkin Resolution. December 22: Cooper-Church Amendment in Senate to forbid U.S. ground troops in Cambodia and Laos fails. January 18: George McGovern announces candidacy for president as anti -war candidate, and loses to Richard Nixon on November 7, 1972 who promises "peace with honor". March: Polls show 34% of Americans support the war strategy of the administration. April 19: Huge crowd of supporters, part of Operation Dewey Canyon III, demonstrate in Washington D.C. Veterans, in a display of support for the protesters, throw their combat medals away. April 24: one-half million protestors converge on D.C.
June 13: The New York Times publishes the "Pentagon Papers" removed by Daniel Ellsberg. They are classified "Top Secret". The leak exposes the government's strategies in Vietnam and the slide to a full war beginning with President Eisenhower. Ellsberg was a research assistant at M.I.T. and a former military analyst. In the early years of the war, he was its proponent. All that changed during his research of the 47 volume, 4,000 page Pentagon document. He was aided by an associate Anthony Russo to secretly photocopy the report. Ellsberg had leaked the information to a number of senators who refused to disclose the information on the senate floor where they would be immune from prosecution. The government attempted to enjoin the publication by the Times and Washington Post, but the Supreme Court in a 6 to 3 decision held that the newspapers could publish under their First Amendment right. Ellsberg: "I felt that as an American citizen, as a responsible citizen, I could no longer cooperate in concealing this information from the American public. I did this clearly at my own jeopardy and I am prepared to answer to all the consequences of this decision". June 22: A non-binding resolution in the senate called for total U.S. withdrawal by year's end. 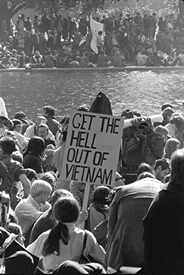 1971 ended with additional protests--- many begun by the VVAW. April 17: Anti ROTC protests at University of Maryland brings National Guard to the campus. May 21: More than 10,000 march on Washington, D.C.
August 22: Protests at the Republican National Convention in Miami Beach, Florida. The year ends, on the eve of a peace treaty, with renewed bombing of Hanoi and the port of Haiphong. In 1977, President Jimmy Carter unconditionally pardoned about 100,000 Americans who fled the country to avoid the draft. About 90% crossed the Canadian border for refuge. The pardon excluded military deserters. Hayden, Tom. The Long Sixties. Paradigm Publishers, Boulder, Co. 2009.